Learn how decorating with apothecary jars can create a beautiful setting for fall using affordable items that you probably already have around the house. If you are looking for some simple ways to decorate your home this fall, you may like this decorating with apothecary jars idea. 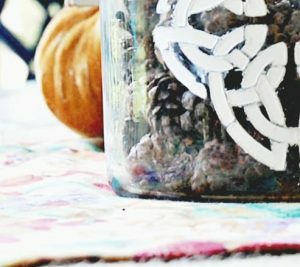 I’m teaming up with a few blogger friends, for our seasonal creative challenge, and this time we are working with glass jars. A special thank-you to Jar Store.com, for supplying us with four beautiful apothecary jars. When you have a minute, stop by Jar Store to see their great selection and fabulous prices on all kinds of containers. 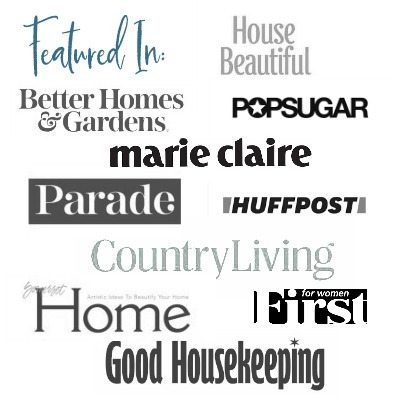 See what I did with my jars, and then stick around to see what the other ladies came up with at the bottom of this post. Here’s what one of the apothecary jars looks like out of the box. Of course, I immediately thought of flowers for a centerpiece and noticed that a regular pint-sized mason jar fit perfectly inside. However, I felt that I needed something pretty to cover the mason jar. Originally I thought about using acorns, but I didn’t have enough real ones to fill 3 jars. Then I purchased one bag of faux acorns, and they looked great, but didn’t quite fill the jar, and would end up costing me somewhere in the range of $50 to fill all three. I settled on this pretty trio of colored popcorn for a little over $3.00/bag. I can’t believe that I never heard of colored popcorn. It turns out that there are many different varieties. Side note: They all end up white, or off-white when popped. This is just one bag of the popcorn and I think it looks great with my sunflowers, black-eyed Susan blooms and elderberry leaves. At some point, I read, or heard, that you should always display items in odd numbers. That is why I only used three of the four jars. Don’t worry because I have lots of ideas for the fourth jar. Instead of having to pick or buy flowers for all three, (though, that would be beautiful) I used white pillar candles on either side of the floral centerpiece. I definitely enjoyed decorating with apothecary jars. The great thing about them is that I can use them over and over again. I think they would make great terrariums, pretty storage containers, and really nice display vehicles too. First off love the popcorn idea.I wk at a large box store Christmas is my favorite all time holiday. We sell real cut trees..and I love the smell..we trim the ends of the trunks for our customers,so that the ends are flat and fit in their stands. I started collecting the round disc pieces and put them in my large jar along with a string of battery lights.its very rustic but beautiful.The lights are LED so they dont get hot. I would sent picture but I broke my leg couple days ago and am on sofa..
I’m so glad you found me too. I use yellow popcorn, dried split green peas, dried red or kidney beans and the colored pasta. All are great fall colors and the popcorn and dried peas and beans can be layered in your jars. All are very in expensive too. Those are all great ideas too! Perfect fall decorations! I love how elegant yet simple it looks! Sometimes simple is best, right? What size is the large jar? Here’s the link to the exact product. It shows all the dimensions on the side. Thats the perfect place to add the Jars, matches well with your decor..You can probably use bird seed too. I have tons of bird seed, so gives me an idea. Its been great getting to know you! I’m a sucker for sunflowers, Patti, so I really love what you’ve done with your jars. The idea of “hiding” a pint jar in the center is just brilliant and I think the multi-colored popcorn is perfect – plus it gives you the added ability to use fresh flowers, which is always nice. I’ve heard about grouping in odd numbers too – probably draws the eye better because it isn’t totally symmetrical. Great concept – and your trio is fabulous! All of the jars are lovely; what a creative way to use such simple jars! Thanks Courtney. It’s always fun to have a challenge. Mine was pretty simple but I like the way it looks. Just in time for company this weekend. 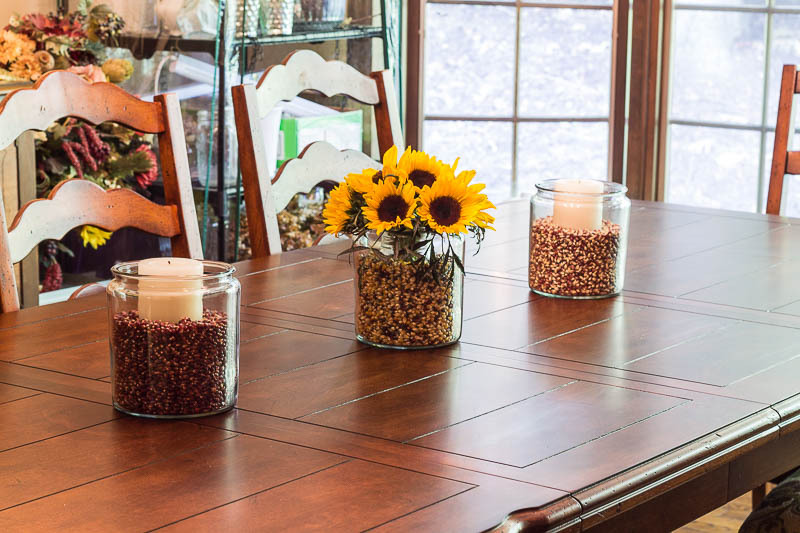 Sunflowers are one of my favorites….love the colored popcorn in the containers….really pretty table centerpiece. I love the sunflowers! The popcorn filler really makes them pop and really gives them that fall look. I think I have the perfect size jar to use inside also! Thanks for the reminder on how to do this. Fabulous look for these decorative jars and your spin on how to Incorporated the beauty of the harvest using them is stunning on your table. Thank you so much for organizing this challenge, a pleasure to work with you. I LOVE the simplicity and the filler of popcorn is fantastic. I’ve been on a popcorn kick lately I make it the old fashioned way on the stove. We were on the same page, something about the table just called these jars. Okay so when’s dinner because this is just so inviting. These challenges are fun and what a blessing to work with so many awesome ladies. Great minds, huh! I would love to have you and Robert over for dinner! One of these days. Thank you for starting it all, and I agree we are a blessed group.